Sarah Almeda Brewer was the daughter of Israel C. Brewer and Sally Brown. Sarah Almeda Brewer married Calvin Galusha Coolidge. Calvin Galusha Coolidge married Sarah Almeda Brewer, daughter of Israel C. Brewer and Sally Brown. John Calvin Coolidge was the son of Calvin Galusha Coolidge and Sarah Almeda Brewer. John Calvin Coolidge married Victoria Josephine Moor. Victoria Josephine Moor married John Calvin Coolidge, son of Calvin Galusha Coolidge and Sarah Almeda Brewer. President John Calvin Coolidge was born on 4 July 1872 at Plymouth, Windsor Co., VT. He was the son of John Calvin Coolidge and Victoria Josephine Moor. President John Calvin Coolidge married Grace Anna Goodhue in 1905. President John Calvin Coolidge died on 5 January 1933 at Northampton, Hampshire Co., MA, at age 60. He was buried at Notch Cemetery, Plymouth Notch, VT.
Grace Anna Goodhue married President John Calvin Coolidge, son of John Calvin Coolidge and Victoria Josephine Moor, in 1905. Simon Huntington Jr. was the son of Simon Huntington and Margaret Barrett. Simon Huntington Jr. married Sarah Clark. [S95] Gary Boyd Roberts, Presidents 1995 Edition, Page 272. Sarah Clark married Simon Huntington Jr., son of Simon Huntington and Margaret Barrett. [S629] Coralee Griswold, Griswold 6 & 7 vol 2, page 947. [S863] Thomas Owen Griswold, Reeve Griswold Family, page 72. [S629] Coralee Griswold, Griswold 6 & 7 vol 2, page 262. [S629] Coralee Griswold, Griswold 6 & 7 vol 2, page 966. Hannah Perkins married Joshua Huntington, son of Simon Huntington III and Lydia Gager. Lydia Huntington was the daughter of Joshua Huntington and Hannah Perkins. Lydia Huntington married Ephraim Bill. Ephraim Bill married Lydia Huntington, daughter of Joshua Huntington and Hannah Perkins. [S95] Gary Boyd Roberts, Presidents 1995 Edition, Page 80/Item 46. [S95] Gary Boyd Roberts, Presidents 1995 Edition, Page 80. [S784] Ann Smith Lainhart and Robert S. Wakefield, John Howland, part 1, page 164. Susan Howland married John Aspinwall Jr. Susan Howland was born on 20 May 1779.1 She was the daughter of Joseph Howland and Lydia Bill. Child of Susan Howland and John Aspinwall Jr.
[S95] Gary Boyd Roberts, Presidents 1995 Edition, Page 79. John Aspinwall Jr. married Susan Howland, daughter of Joseph Howland and Lydia Bill. Mary Rebecca Aspinwall was the daughter of John Aspinwall Jr. and Susan Howland. Mary Rebecca Aspinwall married Isaac Roosevelt, son of James Roosevelt and Maria Eliza Walton. Isaac Roosevelt was the son of James Roosevelt and Maria Eliza Walton. Isaac Roosevelt married Mary Rebecca Aspinwall, daughter of John Aspinwall Jr. and Susan Howland. James Roosevelt was born on 16 July 1828 at Hyde Park, NY. He was the son of Isaac Roosevelt and Mary Rebecca Aspinwall. James Roosevelt married Sarah Delano, daughter of Warren Delano Jr. and Catherine Robbins Lyman, on 7 October 1880 at Algonac, NY. James Roosevelt died on 8 December 1900 at Hyde Park, NY, at age 72. [S95] Gary Boyd Roberts, Presidents 1995 Edition, Page 79/Item 2. [S500] Gary Boyd Roberts, RD600 (2004), Page 333. President Franklin Delano Roosevelt was born on 20 January 1882 at Hyde Park, NY. He was the son of James Roosevelt and Sarah Delano. President Franklin Delano Roosevelt married First Lady Anna Eleanor Roosevelt, daughter of Elliott Bulloch Roosevelt Sr. and Anna Rebecca Hall, on 17 March 1905 at New York City, NY. 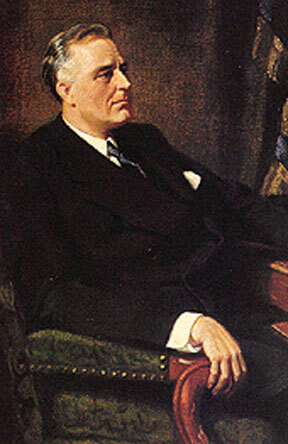 President Franklin Delano Roosevelt died on 12 April 1945 at Warm Springs, GA, at age 63. He was buried at Hyde Park, NY. Following the example of his fifth cousin, President Theodore Roosevelt, whom he greatly admired, Franklin D. Roosevelt entered public service through politics, but as a Democrat. He won election to the New York Senate in 1910. President Wilson appointed him Assistant Secretary of the Navy, and he was the Democratic nominee for Vice President in 1920. [S95] Gary Boyd Roberts, Presidents 1995 Edition. [S110] Rev. Frederick Wallace Pyne Pyne' Register, Vol. 2:Pg. 197/Item m574. A shy, awkward child, starved for recognition and love, Eleanor Roosevelt grew into a woman with great sensitivity to the underprivileged of all creeds, races, and nations. Her constant work to improve their lot made her one of the most loved--and for some years one of the most reviled--women of her generation. She was born in New York City on October 11, 1884, daughter of lovely Anna Hall and Elliott Roosevelt, younger brother of Theodore. When her mother died in 1892, the children went to live with Grandmother Hall; her adored father died only two years later. Attending a distinguished school in England gave her, at 15, her first chance to develop self-confidence among other girls. Tall, slender, graceful of figure but apprehensive at the thought of being a wallflower, she returned for a debut that she dreaded. In her circle of friends was a distant cousin, handsome young Franklin Delano Roosevelt. They became engaged in 1903 and were married in 1905, with her uncle the President giving the bride away. Within eleven years Eleanor bore six children; one son died in infancy. "I suppose I was fitting pretty well into the pattern of a fairly conventional, quiet, young society matron," she wrote later in her autobiography. In Albany, where Franklin served in the state Senate from 1910 to 1913, Eleanor started her long career as political helpmate. She gained a knowledge of Washington and its ways while he served as Assistant Secretary of the Navy. When he was stricken with poliomyelitis in 1921, she tended him devotedly. She became active in the women's division of the State Democratic Committee to keep his interest in politics alive. 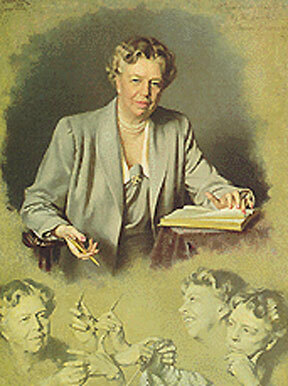 From his successful campaign for governor in 1928 to the day of his death, she dedicated her life to his purposes. She became eyes and ears for him, a trusted and tireless reporter. When Mrs. Roosevelt came to the White House in 1933, she understood social conditions better than any of her predecessors and she transformed the role of First Lady accordingly. She never shirked official entertaining; she greeted thousands with charming friendliness. She also broke precedent to hold press conferences, travel to all parts of the country, give lectures and radio broadcasts, and express her opinions candidly in a daily syndicated newspaper column, "My Day." This made her a tempting target for political enemies but her integrity, her graciousness, and her sincerity of purpose endeared her personally to many--from heads of state to servicemen she visited abroad during World War II. As she had written wistfully at 14: "...no matter how plain a woman may be if truth & loyalty are stamped upon her face all will be attracted to her...."
After the President's death in 1945 she returned to a cottage at his Hyde Park estate; she told reporters: "the story is over." Within a year, however, she began her service as American spokesman in the United Nations. She continued a vigorous career until her strength began to wane in 1962. She died in New York City that November, and was buried at Hyde Park beside her husband. [S110] Rev. Frederick Wallace Pyne Pyne' Register, Vol. 2:Pg. 197/Item 574. [S807] Find A Grave, online http://www.findagrave.com, Find A Grave, database and images (https://www.findagrave.com : accessed 20 February 2019), memorial page for Eleanor Roosevelt (11 Oct 1884–7 Nov 1962), Find A Grave Memorial no. 896, citing Franklin D. Roosevelt National Historic Site, Hyde Park, Dutchess County, New York, USA ; Maintained by Find A Grave . Warren Delano Jr. was born on 13 July 1809 at Fairhaven, MA. He was the son of Warren Delano and Deborah Church.2 Warren Delano Jr. married Catherine Robbins Lyman, daughter of Joseph Lyman III and Anne Jean Robbins, on 1 November 1843 at Northampton, MA. Warren Delano Jr. died on 17 January 1898 at Algonac, NY, at age 88. [S95] Gary Boyd Roberts, Presidents 1995 Edition, Page 79/Item 6. Child of Catherine Robbins Lyman and Warren Delano Jr.
Joseph Lyman III was born on 22 October 1767 at Northampton, MA. He was the son of Joseph Lyman Jr. and Mary Sheldon. Joseph Lyman III married Anne Jean Robbins, daughter of Lt. Gov. Edward Hutchinson Robbins and Elizabeth Murray, on 27 October 1811 at Milton, Norfolk, MA. Joseph Lyman III died on 11 December 1847 at Northampton, MA, at age 80. [S95] Gary Boyd Roberts, Presidents 1995 Edition, Page 79/Item 14. Anne Jean Robbins was born on 3 July 1789 at probably Milton, MA. She was the daughter of Lt. Gov. Edward Hutchinson Robbins and Elizabeth Murray.1 Anne Jean Robbins married Joseph Lyman III, son of Joseph Lyman Jr. and Mary Sheldon, on 27 October 1811 at Milton, Norfolk, MA. Anne Jean Robbins died on 25 May 1867 at Somerville, MA, at age 77. Joanna Cooke was the daughter of Aaron Cooke III and Sarah Westwood. Joanna Cooke married Samuel Porter Jr.
Child of Joanna Cooke and Samuel Porter Jr.
Samuel Porter Jr. married Joanna Cooke, daughter of Aaron Cooke III and Sarah Westwood. Aaron Porter was the son of Samuel Porter Jr. and Joanna Cooke. Aaron Porter married Susanna Sewall. Susanna Sewall married Aaron Porter, son of Samuel Porter Jr. and Joanna Cooke. Susanna Porter was the daughter of Aaron Porter and Susanna Sewall. Susanna Porter married Aaron Cleveland III. Aaron Cleveland III married Susanna Porter, daughter of Aaron Porter and Susanna Sewall. Aaron Cleveland IV was the son of Aaron Cleveland III and Susanna Porter. Aaron Cleveland IV married Abiah Hyde. Abiah Hyde married Aaron Cleveland IV, son of Aaron Cleveland III and Susanna Porter. [S95] Gary Boyd Roberts, Presidents 1995 Edition, page 50. [S95] Gary Boyd Roberts, Presidents 1995 Edition, page 51. Richard Falley Cleveland married Anne Neal. Richard Falley Cleveland was born on 19 June 1804 at Norwich, New London Co., CT. He was the son of William Cleveland and Margaret Falley. Anne Neal married Richard Falley Cleveland, son of William Cleveland and Margaret Falley. President Stephen Grover Cleveland was born on 18 March 1837 at Caldwell, NJ.1 He was the son of Richard Falley Cleveland and Anne Neal. President Stephen Grover Cleveland married Frances Folsom on 2 June 1886 at The White House, Washington, DC.1 President Stephen Grover Cleveland died on 24 June 1908 at age 71. Grover Cleveland, twenty-second President of the Untied States, and the only Democrat to hold the office of Chief Executive since the time of Buchanan, was born at Caldwell, Essex County, N. J., March 18, 1837. He was the third child of the Rev. Richard Falley Cleveland and Anna Neal Cleveland, and he was christened Stephen Grover, though the first of his given names was never used. The family of which the late ex-President was a member dated back in this country to Moses Cleaveland, a native of Ipswich, Suffolk County, England, who emigrated to Massachusetts in 1635. Aaron Cleveland, a great grandson of Moses and the great-great- grandfather of Grover, was the first of the line to drop from the name the superfluous "a." He was an intimate friend of Benjamin Franklin, and died in Franklin's house in Philadelphia, whither he had gone for medical treatment. Richard Falley Cleveland, the ex-President's father, was a graduate of Yale, and was ordained into the Presbyterian ministry in 1829, marrying in the same year. His wife, Anna Neal, was of Irish and German descent, the daughter of a book merchant of Baltimore. Thus Grover Cleveland came of a mixed stock, almost typically American, formed of a union of English, Irish, and German. At the time of Grover Cleveland's birth his father was the pastor of a church at Caldwell. The former occupant of the parsonage had been the Rev. Stephen Grover, after whom the son of Dr. Grover's successor was called. The name Stephen was dropped early in boyhood, but much was said and written about it at the time of Mr. Cleveland's first nomination for the Presidency. When Mr. Cleveland was but 4 years old his father accepted a call to Fayetteville, near Syracuse, this State, where the family lived nine years, moving thence to Clinton, Oneida County, for three years, and afterward to Holland Patent, a small village fifteen miles north of Utica. The elder Cleveland died within three weeks of entering upon his new ministry at the latter place, leaving a widow and nine children. The widow continued to live there until her death in 1882, and the place was also the home for many years of Grover's favorite sister, Rose Elizabeth, the writer. Both at Fayetteville and at Clinton Grover Cleveland had the advantage of being able to attend, though not with strict regularity, an academy. At the age of 14 he was a clerk in a small store in Fayetteville at a salary of $50 a year. He was to have received double the amount the second year, but the family moved away, much to the boy's disappointment. He was preparing to enter Hamilton College at the time of his father's death, being then 17 years old. From that time on he was compelled to earn his own living and to aid his mother. At that time, 1853, Grover's brother William, who was a teacher in the New York Institute for the Blind, was made Principal of the institution, and Grover obtained an appointment as his assistant. Teaching the blind, at that time, was an exceedingly arduous process, as there were no text books. Grover Cleveland remained but a year in the institution, when he determined to study law, and returned to his mother's home at Holland Patent. This visit home, as later developments proved, was the turning point in his life. A neighbor, Ingham Townsend, urged him to enter the ministry, but the young man was intent on studying law, and borrowed $25 from Mr. Townsend wherewith to reach Cleveland, Ohio, where, he believed, he could obtain employment in a lawyer's office. He decided, however, to visit his uncle, Lewis F. Allen, at Buffalo before going on to Cleveland. Mr. Allen was engaged at that time in writing a series of books, and employed young Grover to help him, paying him, for six weeks' work, the sum of $60. Later, however, young Cleveland's services were acknowledged in the preface of one of the volumes, published in 1861. In the meanwhile, however, Mr. Allen persuaded his nephew to give up the idea of a trip further west, and in August, 1855, Grover Cleveland began the study of law in the office of Rogers, Bowes & Rogers in Buffalo, his actual position being that of copyist and clerk. He pursued his studies arduously, and four years later, in 1859, he was admitted to the bar. He remained with his employers for three years after being admitted, however, receiving, at first, $600 a year, and later $1,000. This was in 1863, and the civil war had reached its critical stage. Years later there was considerable criticism of Mr. Cleveland's action in not having served his country in the war. On his behalf his friends have asserted that from the time of his first employment in Buffalo a part of his earnings had been dispatched regularly to his mother, and that when the war broke out he found himself in the position of having to decide whether he should continue to contribute to his mother's support or take up arms in defense of his country. It was decided eventually that his two younger brothers should join the Northern army, while he should remain in Buffalo and take care of his mother. This was done. Later Mr. Cleveland obtained the services of a substitute, to pay whom he had to borrow money. Mr. Cleveland's professional life really began in 1863. In January of that year he was appointed Assistant District Attorney of Erie County. His new position took him from the narrow paths he had been following and brought him into contact with men of affairs, enabling him to obtain a wealth of experience which was of great use to him in later years. As a pleader in court, he obtained his first grounding in public speaking, developing early a directness of speech which marked his utterances ever afterward. Owing to the fact that the District Attorney, Torrance, lived twenty-five miles from the city, Mr. Cleveland had, perhaps, more than his share of the office work, but he was glad of the opportunity; anxious for work that would give him experience; extremely desirous of a thorough training in his chosen profession. Among the prominent and able politicians in Buffalo at that time, with whom young Cleveland came constantly in contact, were Albert Haller Tracy, ex-President Fillmore, Nathan K. Hall, who had been Fillmore's Postmaster General, and Congressman Solomon G. Haven. He had been appointed as a Democrat, and a Democrat he remained always and unwaveringly. When in 1865 the District Attorney died, he, although only 28 years old, received the nomination. Erie County being strongly Republican at that time, he was defeated. His opponent in the race, the first political race of his career, was Lyman K. Bass, a warm personal friend. Entering private practice, Mr. Cleveland formed a partnership with Isaac V. Vanderpool, and the business of the firm increased rapidly. In 1867 he declined an appointment as Assistant United States District Attorney for Northern New York, and two years later formed a law partnership with A. P. Lanning and Oscar Folsom, the father of Frances Folsom, whom he afterward married. After this partnership had done a prosperous business for two years, Mr. Cleveland withdrew to accept the nomination for Sheriff of Erie County, to which office he was elected. The acceptance of this nomination was a matter to which he gave deep thought. Finally, having made the choice, he told his friends that he had done so in order that he might have more time for reading and professional study; an opportunity to save a modest competency and at the same time retain his professional relations. Mr. Cleveland served as Sheriff for three years, at the end of which time he believed himself a sounder advocate and a man of graver and maturer intellect. While in office two of his brothers who had served in the army were lost at sea in the burning of the steamer Missouri, off the Island of Abaco. This was in 1872. Forming a partnership with Lyman K. Bass and Wilson S. Bissell, Mr. Cleveland again took up the practice of law. Later Mr. Bass's place in the firm was taken by George J. Sicard. Mr. Cleveland's personal success as a lawyer was considerable, and he remained with the firm until 1881, when he accepted the nomination for Mayor of Buffalo. This nomination was largely the outcome of his own deep interest in politics, which had gradually developed during the years of his residence in Buffalo, until he had become one of the chief counselors of his party in his home town. He was elected by the then unusual majority of 3,530, the largest that had ever been cast for a candidate for that office up to that time. Early in his career as an elected officer Mr. Cleveland became known as the "veto Mayor." Afterward he was know as the "veto Governor" and the "veto President." He wielded the power of the veto with great freedom, and sometimes quite unexpectedly. His first veto astonished the State, though it had to do with a comparatively small matter. An appropriation of $500 by the City Council for the observance of Decoration Day had been authorized from certain moneys set aside for the celebration of Independence Day, and there was an ordinance against using funds set aside for one purpose for another. Hence the veto. Shortly after this came the so-called "plain-speech veto," which concerned a street- cleaning contract awarded at a price of $422,500 for five years, though an unsuccessful bidder had offered to do the work for $100,000 less. After a successful administration as Mayor Mr. Cleveland was put forward as a candidate for the nomination for Governor. The Buffalo Daily News, formerly a Republican newspaper, being the first to announce his candidacy. Among his opponents in the race for the nomination were Roswell P. Flower and Gen. Henry W. Slocum. After a spirited canvass he obtained the nomination, largely through the votes of the Tammany representatives who had failed of admission to the convention of the year previous. Mr. Cleveland was nominated on the third ballot. Mr. Cleveland was elected Governor of New York State by a majority of 151,000 and a plurality over the Republican candidate, Charles J. Folger, of 192,000. The Republican Party that year was split by factional fights, and there was considerable dissension over Federal interference in State politics. In his first message as Governor Mr. Cleveland urged the removal of restrictions on the canals of the State and had the pleasure of seeing his views carried out. He also devoted much of the message to the matter of health, the supervision of banks, schools, and charitable institutions, and to the question of municipal governments, which was just then attracting widespread attention. On this score he urged against divided responsibility. As Governor he added to his reputation for vetoing measures unexpectedly, at one time declining to sign a bill appropriating money for a soldiers' monument, declaring that though the object was an admirable and patriotic one, he could not forget that the money must come from the pockets of the taxpayers, and all that justified the collection of such funds was the safety and substantial welfare of the citizens. As, before him, Tilden and Seymour had found the Governorship of this State a stepping stone to the nomination for the Presidency, so with Cleveland. He met with opposition of no mean order from Roswell P. Flower, Gen. Slocum, and Abram S. Hewitt. When the convention met in Chicago with the names of Gen. Palmer of Illinois, Senator McDonald of Indiana, Thomas Hendricks of Indiana, John G. Carlisle, William R. Morrison, Judge Truman, and Samuel J. Randall before it, it was discovered that the party was so divided that to unite on any one of these men was practically impossible. The delegates turned their eyes then to Cleveland, and he was nominated with great enthusiasm, Mr. Hendricks being named for the second place on the ticket. Thus the preconcerted arrangement of one man from the East and the other from the Middle West was carried out satisfactorily. In the campaign that followed Mr. Cleveland adopted an unusual stand by refusing to make speeches. He made but two during the whole of the time, one at Newark and one at Bridgeport. Each was brief in the extreme. Mr. Cleveland received a majority of 37 in the Electoral College. The first term of Grover Cleveland as President of the United States was not made notable by any striking events. The foreign relations of the country, on the whole, were tranquil. The dispute with Mexico over the imprisonment of Cutting was annoying, but comparatively trivial. The dispute with Italy and Austria-Hungary over the nomination of A. M. Kiely as Minister was more dignified. Both Courts considered Kiely person non grata; Italy, because he had denounced King Victor Emmanuel for his treatment of the Pope, and Austria-Hungary because his wife was a Jewess. The President administered a stinging rebuke by refusing to appoint any Minister to Vienna for a year. Two treaties were made during the first Cleveland term; one with England, providing for the extradition of criminals for a greater number of offenses, and the other with Great Britain and Canada, for the purpose of settling long existing controversies between the latter country and the United States. Home affairs were administered with success, the enlargement of the navy being given particular attention, under the administration of William C. Whitney as Secretary of the Navy. It was in this term, in the general belief, that the foundation of the navy as the efficient body of fighting ships which dealt with Spain was laid. A navy large enough to dignify the dictates of the country was, with Cleveland, a doctrine of the first importance. The term, too, was marked by a restoration of good feeling and relations between the North and the South. The defeat of Cleveland by Harrison in 1888 is generally attributed to his tariff message of the year before, but there are those who differ from this view, declaring that if it be true that the President's views on that question did accomplish the defeat of the party in 1888 it undoubtedly brought victory in 1892. It is freely asserted that the party lost because it could not hold States that were naturally Democratic, owing to factional differences and the personal ambitions of some politicians. Cleveland was defeated in the Electoral College, but his tariff utterances mush have found favor with the people, for in the popular vote he had a plurality over Harrison of 100,476. Mr. Cleveland spent the four years between his first and second terms in practicing law in this city, succeeding remarkably, and all the time abstaining from the discussion of public questions. His second term will undoubtedly be regarded always as one of the most important peace periods in the history of the country. The President was called upon to deal with almost every question of importance that had at different times perplexed the National councils. Pensions, civil service reform, and the silver question were among the chief of these. Perhaps, among home affairs, his action in making a contract with J. P. Morgan and August Belmont for the immediate purchase of sufficient gold to prevent the threatened adoption of the silver standard was the most important of all, considered in relation to the man. It raised a great cry of denunciation, but his friends ably defended the President, declaring that he had adopted the only means of saving the Nation from dishonorable bankruptcy. It was perhaps in his foreign policy, however, that Mr. Cleveland's second Administration was the more brilliant. His disposition of the case of Queen Liliuokalani was considered admirable, even by some of his enemies. He felt sure that the Minister to Hawaii, Stevens, had acted in a lawless manner in landing a detachment of troops from Boston and recognizing the Provisional Government the day after the old Government had been overthrown, and while it was still able to hold its own except against the arms of the United States, and he said so unequivocally; though Congress disagreed and upheld Stevens. Of even greater importance was his action in the Venezuelan boundary dispute; perhaps the best known of his official actions. In his message of Dec. 17, 1895, he gave expression to the broadest view of the Monroe Doctrine that had ever been enunciated in the diplomatic history of the country. The correspondence between this country and Great Britain over the matter had lasted a year, and little had been done. There had seemed to be no cause for tension between the countries, but the Cleveland message, setting forth clearly and determinedly the attitude of the United States, was received with amazement, and the shock of arms between the two old-time foes, Uncle Sam and John Bull, was looked for. Reading like an invitation to war, the message really made for peace. As a result of it the question was settled once for all, and the power of the United States in the Western Hemisphere firmly established. Grover Cleveland had married, on June 2, 1886, at the White House, Frances Folsom, the daughter of his former law partner. She became the youngest and was accredited with being one of the most beautiful mistresses of the White House. At the time of her marriage she was 22. Ruth, the first child of the union, was born in this city on Oct. 3, 1891. The second child, Esther, was born in the White House, Sept. 9, 1893, during President Cleveland's second term. Mr. Cleveland retired to private life on March 4, 1897, making his home at Princeton, N. J., and withdrawing almost entirely from discussion of public affairs, though at one point he opposed vigorously the policy of "imperialism," declaring it contrary to the practice of the country since the time of Washington. Mr. Cleveland came somewhat prominently before the public again at the time of the insurance scandals, when the Equitable Life Assurance Society passed from the control of James Hazen Hyde into the hands of Thomas F. Ryan. Mr. Ryan set Paul Morton at the head of the active management of the company, but chose also a committee of three whose duty it should be to guard the policy holders' interest. This committee was headed by Grover Cleveland, his associates being Morgan J. O'Brien and George Westinghouse. The sagacity of Mr. Ryan in choosing Mr. Cleveland for such work was recognized at once, and beyond all question the presence of the former President on the committee went a long way toward allaying the fears of the policy holders the country over, and quieting the tumult that the disclosures of the former management's practices had raised. To a certain extent, Mr. Cleveland became identified with the life insurance business from that time on. Last year, in February, he was chosen for the position of Chairman of the Executive Committee of the Association of Life Insurance Presidents, at a salary of $25,000 a year. In the meanwhile, too, he had acted as rebate referee for the Mutual, Equitable, and New York Life Insurance Companies, and this work constituted the chief business activity of his later life. From time to time during the last years at Princeton Mr. Cleveland, in interviews and otherwise, reiterated the doctrines that brought him fame in his earlier years, and occasionally expressed trenchant views on current topics. Mr. Cleveland after 1897 spent the greater part of each year at Princeton, surrounded by his family, living simply and quietly. His vacations were passed chiefly at Buzzard's Bay, Mass., at his country house, Gray Gables, where he indulged in his favorite pastime of fishing to his heart's content. At the age of 70 he declared himself still young, and he was still an ardent tariff reformer and as ardent a fisherman. At times, in 1907, he fell ill, but rallied again and again, while the entire Nation watched with great interest and deep feeling, for Mr. Cleveland unquestionably enjoyed the admiration of all, even his former political opponents, and to him was heartily accorded the veneration and respect due to the only living ex-President of the United States. Frances Folsom was born on 21 July 1864. She married President Stephen Grover Cleveland, son of Richard Falley Cleveland and Anne Neal, on 2 June 1886 at The White House, Washington, DC.1 Frances Folsom died on 29 October 1947 at Baltimore, Baltimore Co., MD, at age 83. Nathaniel Lewis was born on 1 October 1676 at Farmington, Hartford Co., CT. He married Abigail Ashley on 25 November 1699. Nathaniel Lewis married Thankful Pomeroy, daughter of Deacon Medad Pomeroy and Experience Woodward, after 14 October 1723. Nathaniel Lewis died on 24 February 1752 at Farmington, Hartford Co., CT, at age 75. Abigail Ashley was born on 27 April 1681 at Westfield, MA. She married Nathaniel Lewis on 25 November 1699. Abigail Ashley died on 11 April 1723 at Farmington, Hartford Co., CT, at age 41. James Roosevelt was the son of Isaac Roosevelt and Cornelia Hoffman. Isaac Roosevelt was the son of James (Jacobus) Roosevelt and Catherina Hardenbroeck.